We have established the groundwork for long term success by providing quality workmanship, staying current on new construction methods and government regulations, supporting a strong safety program, and by showing we have the ability to be innovative in meeting customer needs. Whether you work with Myrick Construction to simply build a slab and shell building, or a turnkey construction project, you can place your confidence in our company. Myrick Construction self performs most of the steel erection work for our projects. For almost 50 years, we have specialized in the erection of pre-engineered metal buildings. Although pre-engineered metal buildings have been a part of many of our projects, we have the capability and experience to build conventional steel structures also. 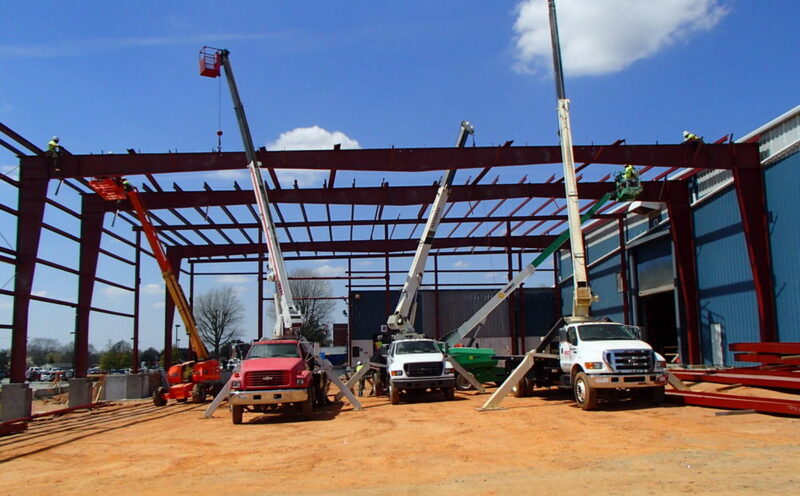 Our steel erection crews have extensive knowledge of steel and steel erection. This includes the capabilities of certified welders and certified crane operators on staff. Our certified welders have a wide range of skills, working with stainless, galvanized, and traditional steel welding. Having erected over 4,000 structures, our knowledgeable and experienced employees can add significant value to your project. Safety and quality are of utmost importance when erecting and modifying steel structures. We maintain a rigorous safety program that establishes a culture and practice of safe construction. One of our top priorities is for all employees to return home safely each day.